Children in North Philadelphia face a unique set of obstacles. Growing up in one of the poorest urban centers in America and struggling to stay on grade level and away from some of the devastating consequences that surround an area dealing with poverty is a lot for a child to handle. Hope tends to lie in people and programs that are designed to keep kids from falling through the cracks by identifying needs and working in conjunction with other groups to meet them. Change Course is about molding that hope within the Free Library’s mission to advance literacy, guide learning, and inspire curiosity. 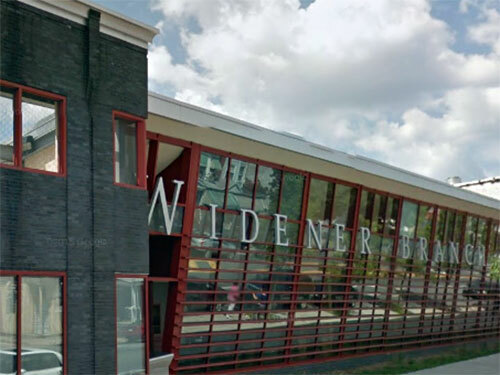 The Widener Library has partnered with Philadelphia’s Department of Human Services (DHS) to create a reading diversion program to excite and enliven the kids in our city who need extra reinforcement and outlets for their growth. Focusing on children ten and above who have no previous delinquency or juvenile probation supervision, we have created a program to harness the power of group readings of relatable texts, engaging discussions, and empowering activities. DHS is working in conjunction with community partners like the Philadelphia Anti-Drug/Anti-Violence Network (PAAN) and Norris Square Community Alliance (NSCA) for referrals and groupings of kids who are “on the bubble.” Widener has already been a center for services like Stories Alive, and Words at Play, making Change Course a logical and exciting venture for this location. As part of Intervention Prevention Services (IPS), these children need support, for a variety of reasons, and through the intersection and communication of these groups, they can get it in many forms, including at their local library. Utilizing high interest-low vocabulary texts, we’ve begun to examine some of the issues facing our kids, in a way that’s rooted in the reading and dissection of a text that feels relevant to them. The goal is open and voluntary read-aloud to help build confidence for kids who are behind and engage them in text-to-self connections that have meaning beyond just a grade. The activities are hands-on and molded to each group dynamic, with an emphasis on keeping their personal lives intertwined in the group in a way that facilitates dialogue and a greater understanding of everyone present. 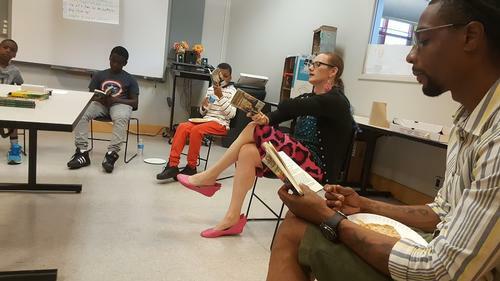 Creating a safe space, one that allows kids to utilize the services of the library, engage in a text, and speak freely about their interpretations and connections, remains deeply powerful. Last fall, we launched a ten week joint undertaking, bringing together groups of middle and high school kids from opposite sides of Lehigh Avenue. With that in mind, for our high schoolers, we used Walter Dean Myers’ classic, 145th Street, a series of vignettes that tells the stories of the wildly diverse cultures and lives, all taking place around this one street. For our middle schoolers, we looked to the Bluford High Series, and zoomed in on one text: The Bully by Paul Langan. Its honest and harsh depiction of the realities of bullying and trying to figure out who you are as a young adult speaks to anyone who has ever felt like an outsider struggling to fit in. As each of these texts and the discourse that comes from them continues to unfold, more and more about our ever-changing kids is coming to light. It’s definitely exciting to see! Change Course is a reading diversion program to excite and enliven the kids in our city who need extra reinforcement and outlets for their growth.